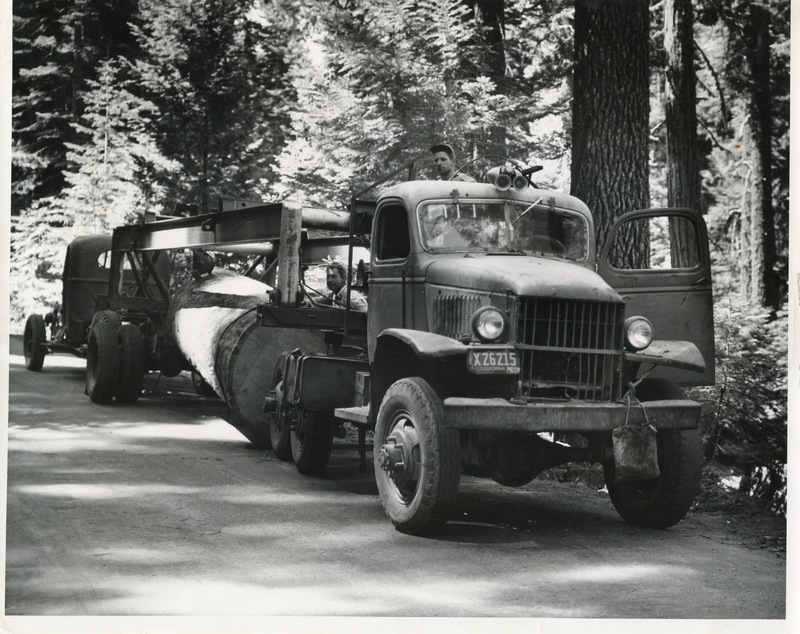 Editors note: Ted Shannon, FLM member in charge of our outdoor exhibits, gathered this history of our truck. This all-wheel-drive truck was built in May 1945 for the U.S. Marine Corps as a cargo carrier. WW11 ended in early September, 1945 and this truck stayed stateside at Camp Roberts, California. It was purchased there from the U.S. Government in late 1945 by Alfred Copeland. 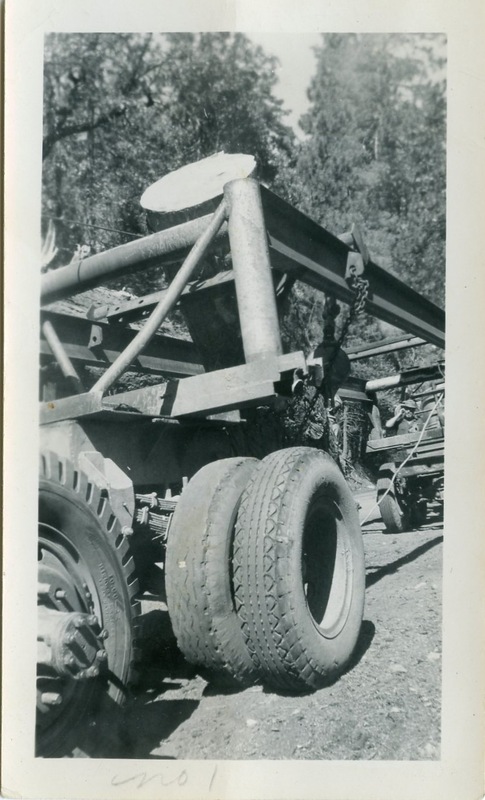 He initially used it to haul rocks during the construction of Soledad state prison. 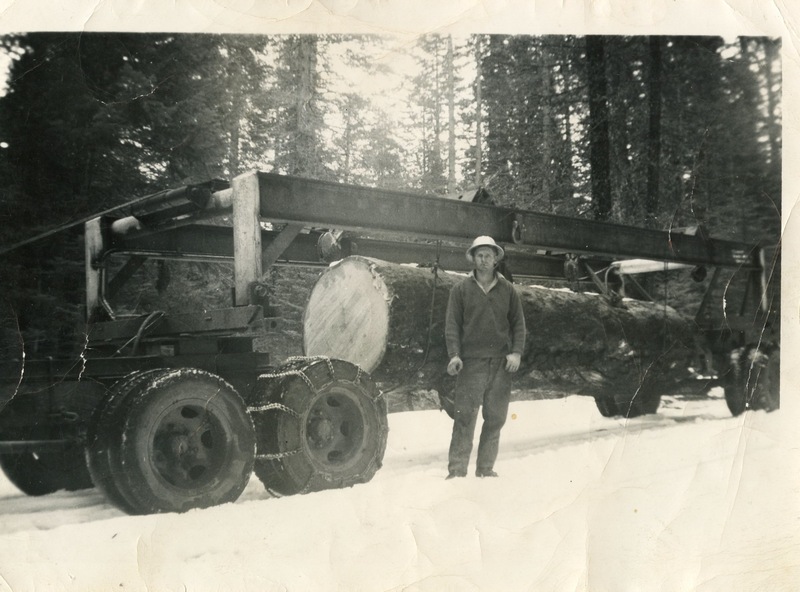 He then moved to Sonora, California, converted it to a logging truck and used it in that capacity for many years. It has a 5 speed transmission with a high and low range, an International “Red Diamond” 361 cubic inch straight six cylinder gasoline engine with two carburetors. 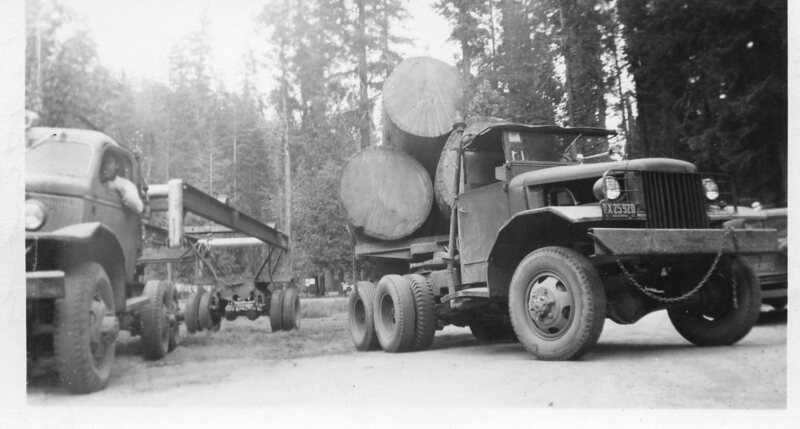 Many ex-military trucks were pressed into civilian duties after the war; they were available and affordable, but much too slow for today’s trucking needs. 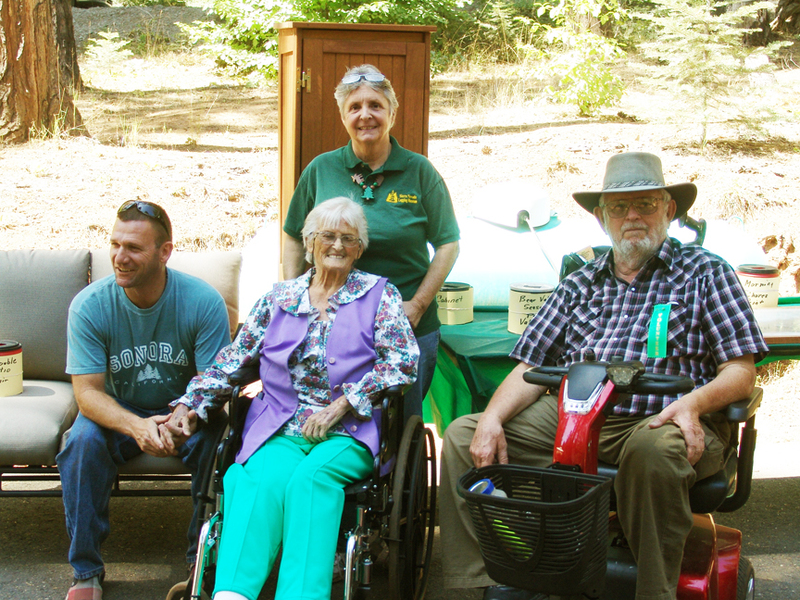 FLM volunteers attached the truck logging bunk equipment and connected the wooden-reach logging dolly, both donated by Page and Page Trailers of Redding, California. Wooden reaches were commonly used well over half a century ago, but broke occasionally, and were replaced by steel reaches. 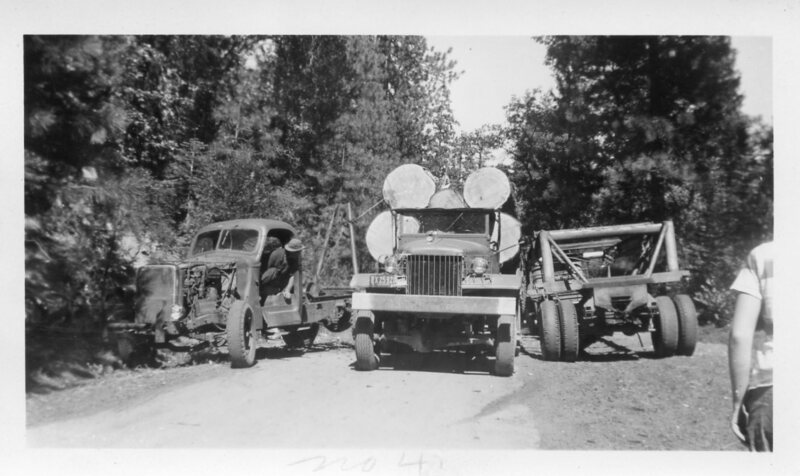 Gasoline engines continued to power big trucks for many years after WW11 ended, but the inevitable switch to more economical diesel engines began in the 1930s. 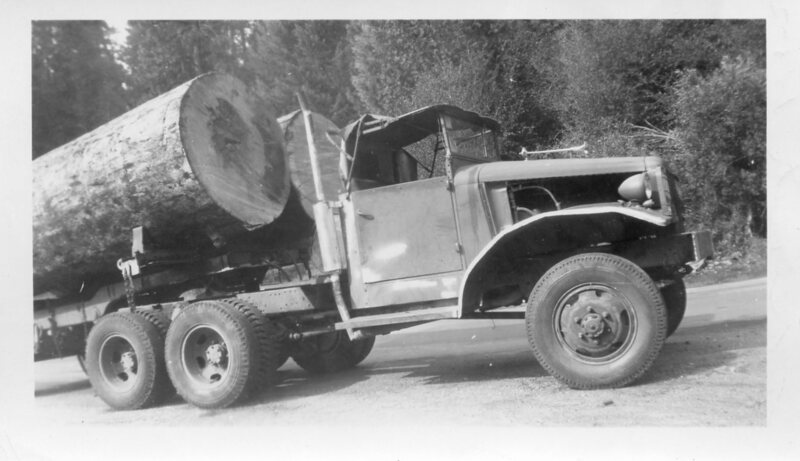 Trucks hauled a small percentage of logs in the early 1900s. 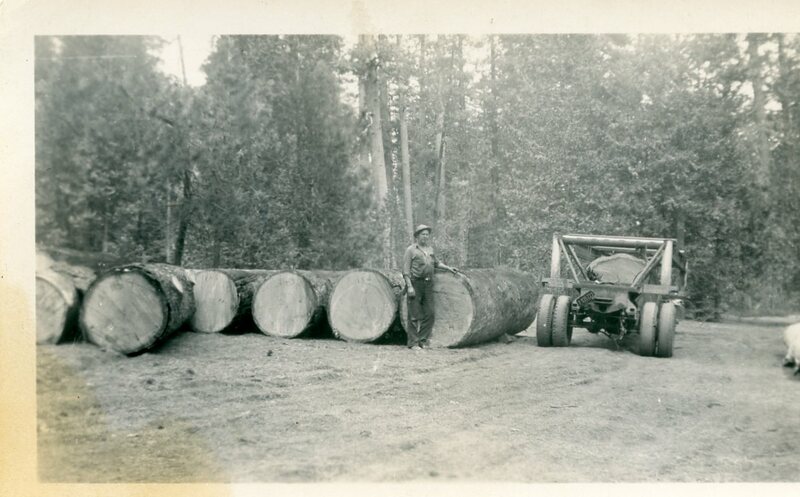 Today, almost all logs are hauled by trucks. Wonderful photos of our truck in action and an amazing trailer that Mr. Copeland built to do a number of big jobs. No one we have talked to has ever seen anything like it. All the photos now have the capability of being enlarged by clicking on them. One great story follows the pictures of the truck the story is about. After that story, many more great photos. 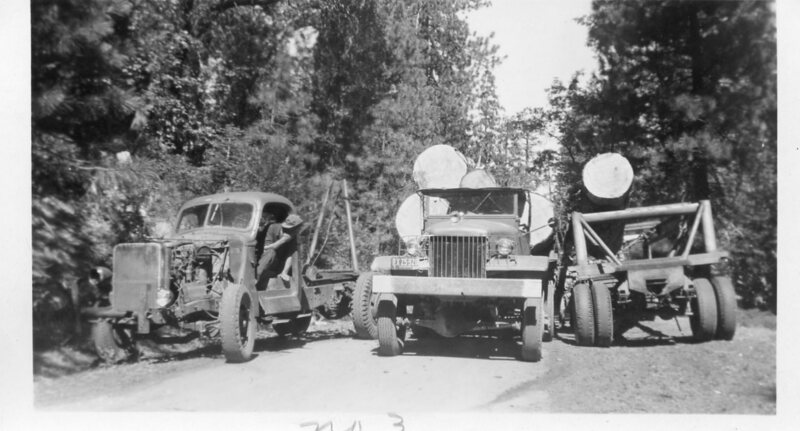 Note the interesting trailer on the right, and the winch truck on the left. That trailer had very interesting capabilities. This story and the truck came to us courtesy of the Copelands, Sophie, Alice, Helen, Russell, and the Grand-daughter, Angela. 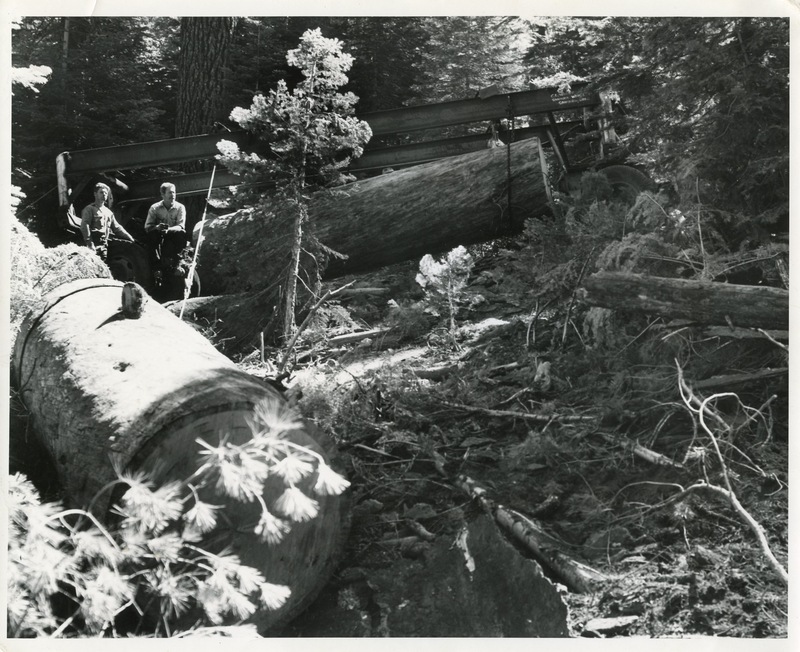 In the mid 1950’s, Mr. Copeland was logging in Yosemite as you can see by the photos and the captions. Like many visitors to Yosemite, Mr Copeland had to deal with the bears. In particular, there was one bear that wanted into the truck to sleep. He may have wanted into the truck originally because there may have been food in there. But, the bear decided that the truck made a great place to sleep. In fact the bear wanted in badly enough to do damage to the door. So, Mr. Copeland removed the door. The bear would climb into the truck at night to sleep, and in the morning, Mr. Copeland would bang on the passenger side door, driving the bear out of the truck so that Mr. Copeland could go to work. Our sincere thanks to the Copelands for the truck, the photos, and the story. Copeland daughter, Helen, called to tell us that she is in one of the photos. Perhaps that is she on the road edge? in many of the photos that follow. Mr. Copeland built this trailer for just the purpose shown in these photos. 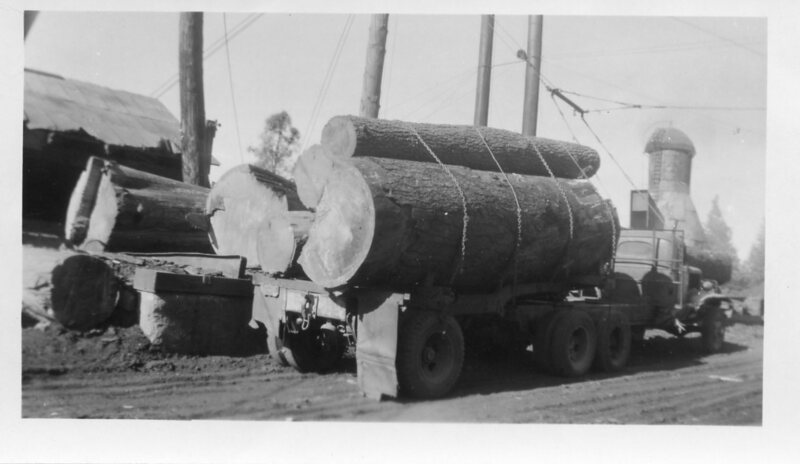 He could load the logs by pushing them under the trailer and then raising them off the ground with a couple of cables. The winch action came from a truck at the rear of the trailer. This truck is shown in one of the previous photos. Mrs. Sophie Copeland at our 2009 Logging Jamboree. 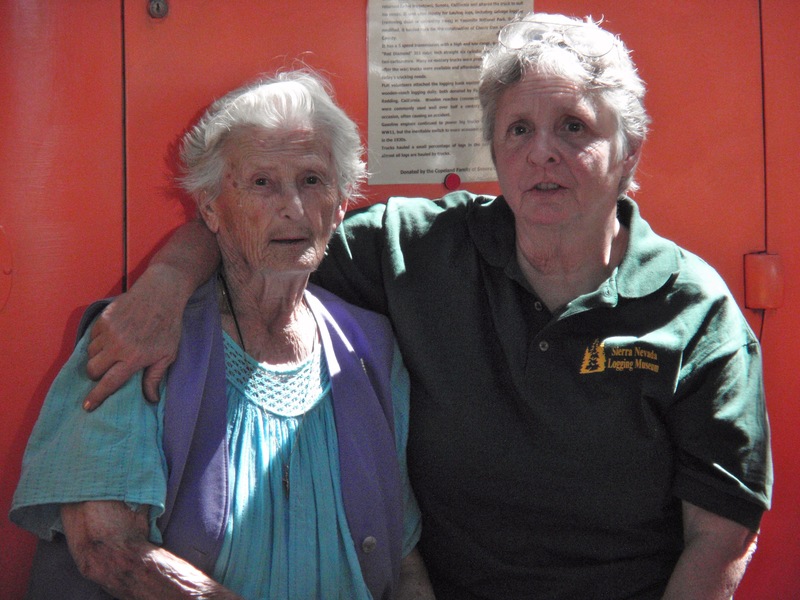 She and the other family members donated the 45 IH truck to the museum and Sophie came to see that we were taking good care of it. Sophie at this time was 91 1/2 years old. 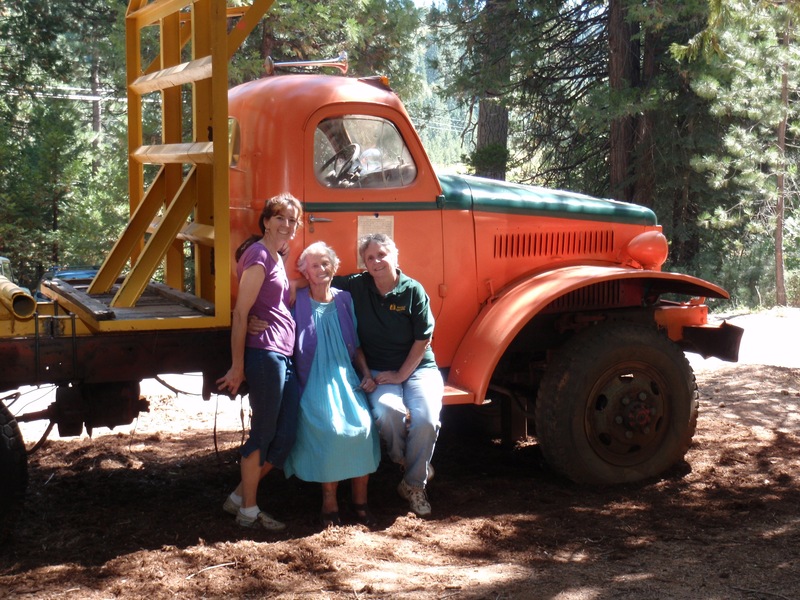 Sophie, her grand=daughter Angela on the left, and FLM President Ginny Kafka at the 2010 Logging Jamboree. The truck had just been painted the week before. Not exactly Linebaugh colors, but on the other hand, it was not ever a Linebaugh truck. Hi.. My father was Clyde Lester Copeland whose mother was Madora Copeland. Madora was mother to Al, Jack, and Iva. I believe that this is my Uncle Al and Aunt Sophia. 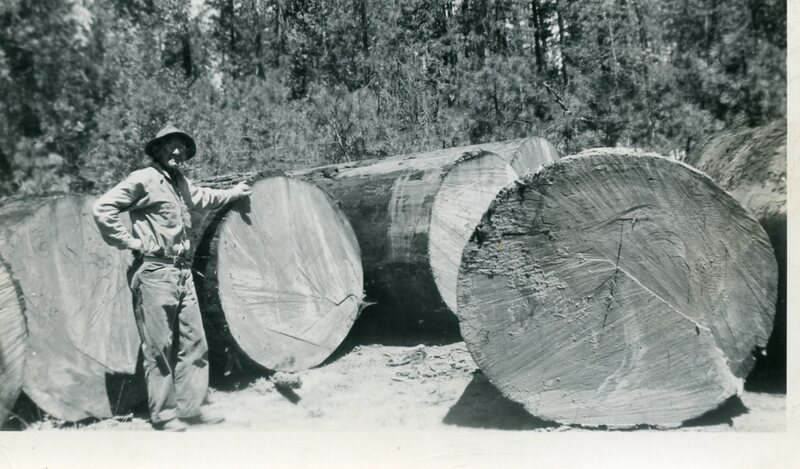 I have some pictures that have been passed down on Uncle Al and my dad logging and also some pictures of a dam that was built back then. Would be nice to make contact if anyone is interested. It would be good to talk with you, and we’d love to see your photos. The museum opens on April 1st, but I won’t be there until early May. I’m the webmaster and therefore, by default, the historian. Sophie is my aunt. If you want the pictures I have including some of a damn being built, just send me you email and I will send them on to you. All the photos we have of the Copelands and the IH truck are on the web site. I assume that Cythia never got what she had to us, unless she physically brought the photos to the museum and I never saw them. I love to see how that truck last long that until now the engine still working. It’s really amazing that after how many years you can still use it even though its cargo is undeniable heavy. I hope you can sustain its performance no matter what happened. Keep up the good work and God bless. We are looking for a man born as an Spaniard around 1920, who after being part of the biggest prison break in 1938 in Northern Spain, arrived to California circa 1939-40, he then enlisted in the army and went back to Europe dring and armored car NCO in WWII. Since he was not yet citizen, with this enlisting he got his nationalization. 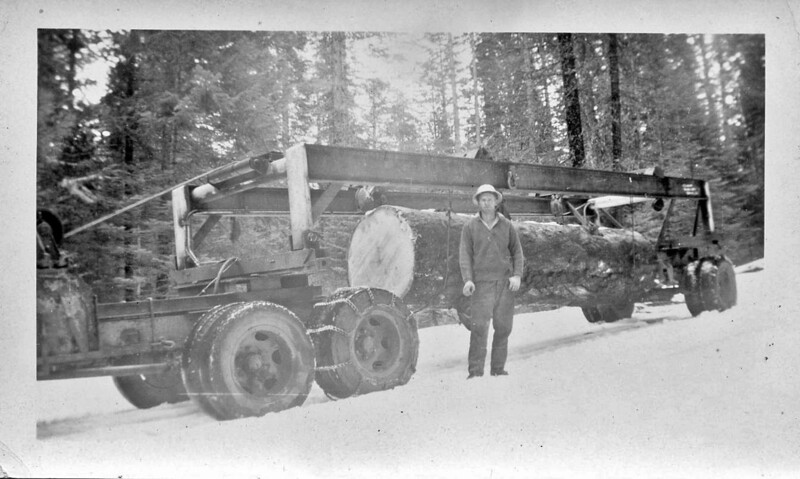 After the war he ran a logging truck company on the axis between Alturas-Chico managed later by his family when he retired to Chico. We are wondering if any of the veterans or anyone in the logging industry in the area has heard about this story or know anything about him.